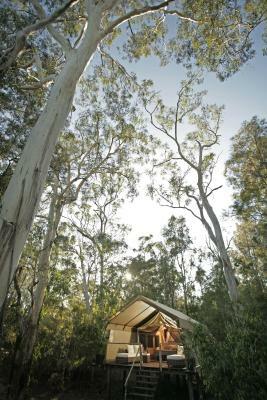 Lock in a great price for Paperbark Camp – rated 9.1 by recent guests! Whole experience magical- food superb it was our 55th wedding anniversary a great way to celebrate! The accommodation was Fantastic. The food was delicious! Possum paret i trädet utanför tältet!!!!! Papegojorna, cikadorna, cykelturen, middagen! Paperbark Camp This rating is a reflection of how the property compares to the industry standard when it comes to price, facilities and services available. It's based on a self-evaluation by the property. Use this rating to help choose your stay! Paperbark Camp offers a peaceful retreat in beautiful Jervis Bay, with unique luxury tent accommodation and an on-site restaurant and bar. Guests enjoy free use of canoes and bicycles. Situated amongst eucalypt and paperbark trees, these safari-style tents are built above the ground for your privacy and comfort. Each has a spacious verandah, wooden flooring, insect screens and solar-powered lighting. All tents include an open-air en suite bathroom with hot shower. Massages are available by prior arrangement and free Wi-Fi access is included. Situated amongst the treetops to enjoy the sea breeze, The Gunyah Restaurant offers modern European-influenced cuisine with an emphasis on locally grown and sourced produce. 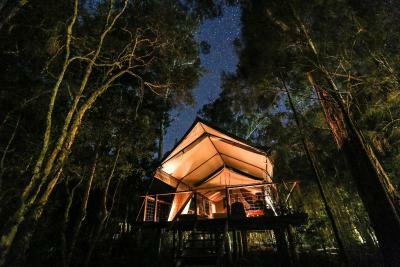 Paperbark Camp Jervis Bay is 2.2 miles from Huskisson and a 10-minute drive from Jervis Bay National Park. When would you like to stay at Paperbark Camp? House Rules Paperbark Camp takes special requests – add in the next step! One child or adult is charged AUD 100 per person per night in an extra bed. Debit card Paperbark Camp accepts these cards and reserves the right to temporarily hold an amount prior to arrival. Paperbark Camp accepts these cards and reserves the right to temporarily hold an amount prior to arrival. Water was hit and miss so didn't end up using the bath. Dining was good but menu was quite limited so didn't eat there after first day. Loved the location and the tent. The service when we came to dinner was slow. Received our water and bread after the water. Had to wait 30 minutes to be served. Ended up ordering at the bar.